Hetta is a Tightrope Walker. A leader of armies. She has been one all her life. But Hetta has just turned thirteen, and there has never been a thirteen-year-old Tightrope Walker. Ever. Is she too old to do her duty? Is she too old to walk upon the field of battle and survive? I didn’t know what to expect when I started reading Tightrope Walker. The blurb didn’t give much away….except that Hetta was a 13-year-old leading armies. But, this author wrote Ewan Pendle and the White Wraith, which I loved, so I said to myself “Why not“. I am glad I decided to take the chance because I loved this book. Hetta is a Tightrope Walker. A Tightrope Walker is a person who leads armies into battle. If an army is lucky enough to have a Tightrope Walker, they cannot be beaten. What makes Hetta so unusual is that she is the only known girl Tightrope Walker and she is 13 years old. It also follows Hetta as she leaves the country of Rightabouthere to go do battle with the country of Ilikethisspot. I did feel bad for Hetta. She was feared by the people who live in the city of This’lldo. They feared what they didn’t understand. They couldn’t see past her Tightrope Walker status to what was underneath. It was a lonely life. Streets clear when she walked down them. No one talked to her in school because they were afraid of her. The only people that she talked to were her father, Queen Regent Muffin (aka Terry) and The General. I couldn’t imagine living like that. I also thought to myself, at one point in the book, “No wonder she’s questioning things“. I also got her surprise when Soggy Rhubarb actually talked to her like she was a regular human being. Of course, it was his talking to her that started her down the path of wondering if all she was a Tightrope Walker. I loved reading the chapters where she was leading her army to the field where the battle would happen. Her love for the army and battle came off the pages. I also liked how she adapted to the surprise of meeting another Tightrope Walker. I would have acted the same way to see another person who could do the same thing I could do. The scenes where she was helping the battle were fantastic!! I will say that The General was one of my favorite characters in the book. He stood with Hetta while she did her magic and he almost sacrificed himself to keep her safe. He was the only one, besides her father, that realized she was still a 13-year-old girl. His words to her while he was in the hospital made tears come to my eyes. He also did explain a lot about Tightrope Walkers and their particular brand of magic. The end of the book had a bit of a twist to it and ended on a cliffhanger. Soggy Rhubarb did make an appearance and the note that he gave Hetta reassured her that she was who she was. Like I said, the end was a twist and a cliffhanger. Usually, endings like that drive me batty but not this one. I need to find out what happens to Hetta. 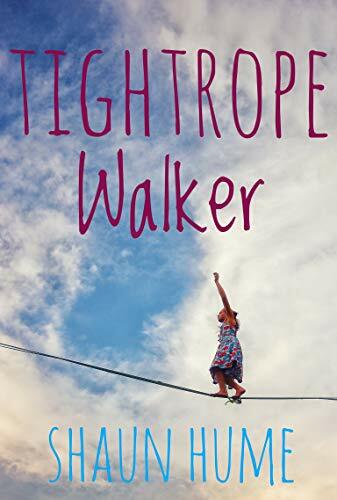 Tightrope Walker is a great middle-grade fantasy. With catchy names, quirky but relatable characters and a plot that was truly interesting, I was very into this book. This is a book that I would feel comfortable letting my middle schooler read. Why: Some mild violence but nothing graphic.